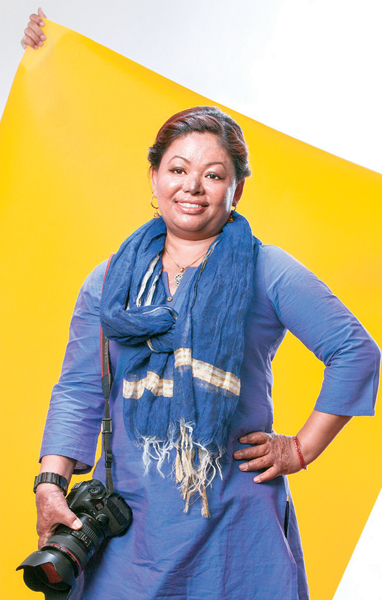 When photographer Arjun Shah asked Sunita Maharjan to wear a yellow sleeveless top for their calendar shoot, she hesitated at first. She was scared to bare her arms and her hands, which suffered third degree burns. She was worried she wouldn’t be able to hide what she believed was her disfigurement. She had been hiding it for 15 years. To get over the unfortunate incident, to put it all in the past and to try to move on with her life has not been easy for her, as is the case with many other burn survivors. Every time she goes out of her house, the stares make her feel different from everyone else. So Arjun’s burn survivors calendar, in which she is featured, has come as a much-needed push, she says. The message that Arjun is trying to spread with the calendar resonated with Sunita and Sita Bhandari, another burn survivor whom Arjun has photographed for the calendar. After having been called ‘bichara’ countless times, the women know that they, and other burn survivors, need to ‘say no to sympathy’. And they feel they are saying that through the calendar. 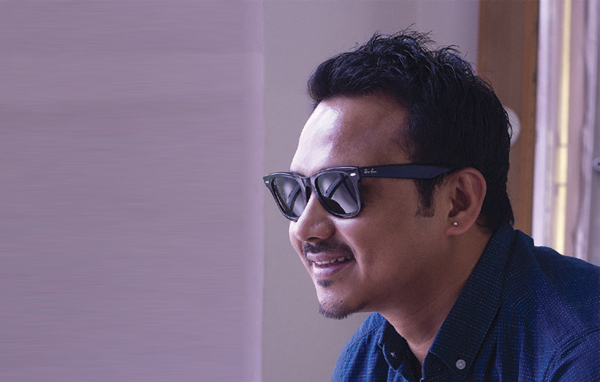 Through the calendar, Arjun, a famous Nepali fashion photographer, is also attempting to spread awareness among people about burn survivors. The coordinator for the calendar project was Radha Shrestha. 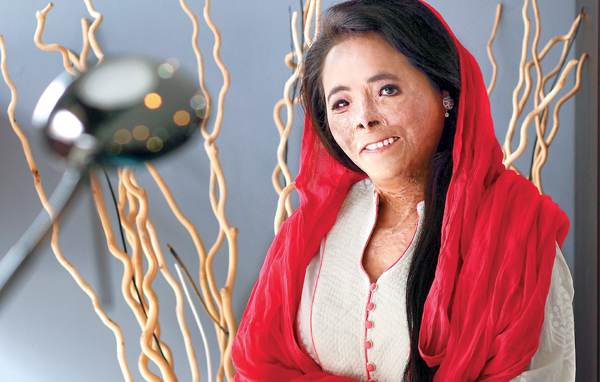 A burn survivor herself, and also a model for the calendar, she could understand their nervousness. She is the founder of Help Society Nepal, and she knew most of the survivors through her involvement in SKM Hospital. Radha and Arjun’s mutual acquaintance, Dr Jaswan Shakya, Medical Director at SKM, brought them together for the project. He was also a constant source of support for the women. With the help of Radha and Dr Shakya, Arjun made sure that the survivors were comfortable with the photoshoot. They told the women that their coming out to a larger public would encourage others like them to find the courage to come out of their shell. The inspiration for the calendar came from a cover shoot that Arjun had done for the Wave magazine in 2015 that featured Jayatri Tamang. Jayatri is also featured in the calendar. It was easier for Arjun to convince the women because they had seen the cover and seen the impact that it had had on them as viewers. “When I saw the cover I felt like I could be of some use too,” says Sunita, who draws her confidence from Jayatri’s courage. “And I was excited about the project.” After an initial two-day workshop to understand their stories better and help them feel comfortable, Arjun began the photoshoot. By then it was very clear what direction he wanted to take with the calendar. He wanted to provide people a window into the survivors’ personalities—their ambitions and their present lives. In the calendar, Sunita stands smiling beside a mannequin’s shadow, with a measuring tape in her hand. After her accident, Sunita received training in tailoring, and she currently works at Ekadeshma: Tales of Nepali Craft, a garment workshop. Sunita also recently participated in a sewing competition in France. In another photo, Sunita has been photographed emerging out of a cloud of smoke in the background, to signify that her dark past is now behind her. Another burn survivor, Sita Bhandari, a Taekwondo black-belt holder, sits on a stool in her workout clothes, looking straight into the camera. Arjun has managed to capture the strength that Sita embodies, her resilience. In her second photo, Sita stands holding a paintbrush in her hand—Sita is also an avid painter, who finds meaning in art. Rasta Khagdi, who had always dreamed of becoming a doctor, is dressed in a lab coat, holding a patient’s medical record. In another photograph, she is seated beside a sewing machine, presented as a tailor, her actual profession. The contrast in the photos are to show that although she didn’t become a doctor, her taking charge of her life is an achievement. The calendar is, thus, a celebration of the women’s overcoming their struggles to become who they are today. The calendar now sells for Rs 350, out of which Rs 50 goes into a fund for burn survivors. The initial idea was to distribute for free all the calendars, printed with the help of Interplast Germany, a non-profit organisation supporting SKM Hospital in burn treatment and reconstruction surgery. But everyone involved realised that the money raised could go toward the treatment of some burn patient, and the team now sell the calendars in Nepal and in other parts of the world. “Because the calendars represent a bold move for a good cause, people have been buying them,” says Arjun. “It will still take some time for most people, to regard the burn survivors as survivors and not victims,” says Arjun. “For change can only come gradually.” But as for the women, the calendar has already helped them overcome the fear of showing themselves as who they are.